UPDATED There two major news today, one just breaking with the "promotion" of Ramirez to the vice presidency of Economic area while the fate of the previous holder, Merentes, is still unknown (he may retain his seat of finance minister but we have no confirmation at this typing). The second news is the expected formal petition for an enabling law for Maduro. Let's start with this later one although the first one is the more revealing news as to what is truly happening. Since Hitler's enabling law, that tool as never led to good results. In Venezuela its use has been abundant and has been abused under Chavez. But at least in previous Venezuelan applications the president was freshly elected with a clear victory over the runner up, or had high numbers all the time like Chavez. Maduro has neither high numbers in polls, nor a clear mandate and even less of a clear victory whatsoever as April vote is now recognized as a fraudulent one even by many the rank and file chavismo (though they remain discrete about it because, well, they are cashing in, you know...). It is not that a limited enabling law with a limited scope to speed up necessary legislation over a punctual problem is necessarily a bad idea, but in a country which under Chavez has revealed its deep lack of democratic fiber such a constitutional figure should be abolished outright. Chavez in his last installment used it to annul the newly elected National Assembly and moved on with it to prepare the grotesque state support for his fraudulent reelection of last year. Maduro advances many made up excuses to request an enabling law of his own, NONE making sense. He wants to use it to fight corruption but all the necessary legislation already exists. The regime simply refuses to apply it, refuses to tackle corruption which latest example is found with a public official caught with 400K euros in cash in Bulgaria. He wants to use it to fight an alleged economic coup, so that there will be no food shortages. But the solution is easy there since the regime already controls all the foreign currency outflow, already controls the price structure, already can expropriate whatever it wants, already can jail any "saboteur". He wants to use it to stop Venezuela's dependency from oil but he forgets that chavismo has been in office for soon 15 years, has had already enabling laws and the end result of them is that MORE THAN EVER we depend on oil. Another enabling law is not going to solve any of these issues. NONE. So, what gives? We need to search the true reasons of the enabling law elsewhere, in the murky waters of the internal power struggles of chavismo. Basically we have two sides, each with significant subgroups. To simplify matters there are the "moderate" which understand the value of money and that we are in a globalized word that imposes some of the rules that all must follow least they fall on the wayside. If the economic failure of Chavez, and Cuba, and Zimbabwe and others are not enough for you to understand what is meant by a minimum of rules to follow then it means that your interests are elsewhere, in Nincompoopia. The "radicals" are the other side, the ones that praise to high heaven the tyranny of the Castros over Cuba, who think that indeed Venezuela belongs to Nincompoopondwana, the famed continent where the USSR was a production power house and where Cuba is actually a tropical paradise. Loosely Diosdado Cabello represented the "moderates", those that love dictatorship with profits. One of his men, or at least kindred spirit in the Maduro government, was Merentes, the finance minister in charge of the vice presidency on economic matters. The "radical" wing was better represented though the fact that "moderates" were officially present seemed to indicate a certain falling back after Chavez death. However in recent weeks it was clear that Cabello did not seem to have the ascendant that he once had. The departure of Merentes, foretold by his clear inability to impose his economic views over Giordani, Jaua and Arreaza, seems to indicate that the "radicals" have finally wooed the "neutral" group led by Ramirez, the smaller, more discrete group in the cabinet but the one that knew how much cash was truly available from oil production. Ramirez is an ideologue, a "resentido social", and should have been counted from the starts in the radical group were it not that his utter lack of charisma and link to the common folk made him realize that he had more to gain personally if he stayed aloof in the immediate post Chavez era. This is how we must read what is going on this week. The "radicals" are trying to edge once and for all whatever "moderates" are left in charge. It is too early to decide for certain whether this is a mere electoral ploy to mobilize the radical bases to avoid a disaster in December. I think unfortunately that it goes deeper than that. The economy is tanking and the radicals feel cornered. They have decided to remove once and for all any democratic pretense so as to remain in power through repression. This start by insuring the unity of chavismo in a single faction, more able to tackle the democratic opposition later on. The questions are now: Will Cabello allow for the enabling law to be voted? Will the corrupt and rich and lazy military cave in knowing full well that they will soil their hands with bloods if the radicals take over completely? Is the intricate network of corruption and blackmail inside chavismo enough to neutralize Cabello and the army higher ranks? Maybe the time has come. UPDATE. So I watched the second part of Maduro's speech at the National Assembly tonight requesting the enabling law. I am not going to go into details as I sort of tweeted it live in Spanish. I am just giving you the executive summary. The performance was pitiful: Maduro had all the trouble in the world reading the speech from a booklet. He did not write the speech, that much was obvious by the amount of words and sentences he had trouble with. In fact it is fair to assume that the speech was written by Giordani, the great apparent winner of the economic struggles of the past months. With the help of some Cuban advisors, of course. The speech was insulting, idiot, uninformed, mean and ideological in a way that not even Chavez would have dared to do in his best years. As such it is clear that his appointed successor and help have not an inch of Chavez skills, but more than his hatred. Then again you need to understand that the speech was not meant for you or me, it was meant for the chavismo rank and file that is getting harder and harder to emote. And also to those inside chavismo that are refusing to follow the Cuban cue as burped out by Maduro. I think the performance was pitiful and I doubt that Maduro got much traction with it. It is clear that his objective is to muzzle any opposition to his rule, and not only the democratic one. That Cabello screamed and cheered is simply beyond my understanding as he is one of the targets of the proposed law. I also doubt that trying to blame all of the shortcomings of 14 years of Chavez and 10 months of Maduro on anyone but themselves really does not work much today. I know, I know, the Venezuelan electorate has demonstrated ample stupidity and venality in the last decade but I am going to remind you the stuff that you can fool all of the time some of the people, some of the time all of the people but never all of the people all of the time. And when I write ALL I mean the group that voted for Chavez in 2000. What happened tonight was indeed a declaration of war but we are not sure against whom, and for what objective. In fact, I am not sure whether Maduro knows. I feel that the only reason this has drug out this long is that up until now there was always the possibility that the opposition, and currently the majority of Venezuelans (whether or not you believe polls) could restore control through democratic and peaceful means. When and if that mask of democracy is removed completely and the thugs try to maintain control through repression, the end of their reign will be quick. The opposition's greatest weakness to their credit is that they continually try to fight fair and follow the constitution and rules of law. This has never been a fair fight. When the rules no longer apply, I would expect a different approach and outcome. Not advocating violence, but you can push only so far before people start to push back. Collapsed economy plus an attempt at complete repression may be too much to repress. Chavismo spends fortunes leading up to elections buying the vote to win by an actual vote count, but have been forced recently to change the results as they please. Why do they go through the effort and expense? To continue to give the impression of a democratic process as long as possible to keep the opposition at bay. Does Maduro increasingly resemble Captain Queeg in Herman Wouk's The Caine Mutiny? Captain Queeg favored collective punishment of all members of his increasingly unwilling crew for his own incompetence. Watch whether Maduro plays with little steel balls when he is nervous. Why is VZ producing any vehicles? Does it not make more sense to buy them from Brazil (among others) where they enjoy some economies of scale? Dave, I think the population and the demand are large enough to have at least a couple of local assembly plants. So, come again, how will this enabling law eradicate the moderate site of Chavismo (if there ever was one)? Diosdado Cabello was in Russia. I think this enabling law will allow Maduro to get more money for campaigning in December and, obviously, to sabotage the work of opposition authorities. I wonder if it is another step in the power struggle between Maduro and Cabello. You have addressed this issue before, this will place another Maduro piece in a critical position and take one that may have aligned with Cablello...is like a chess game. I got to believe that although you may see Cabello in the background cheering, he must have his own plan. I think Cabello know that if things continue to move in this direction he will be eventually lose all his power base, because there will be few if any of his supporters in positions where they could excise any power, then he becomes immaterial, read vulneralbe to be removed or displace or ignore. I don't think he is willing to get there. My prediction is that if he feels at the verge of "check mate", he may reach back to his military friends, and do something about it. 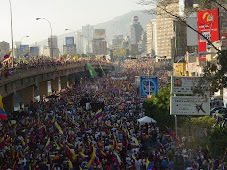 It is my opinion that the people of Vz will not get rid of Maduro, neither by votes nor by protests. If Maduro goes will be the Julius Cesar way. By the Julius Cesar way I mean that he will be removed by people from the same system he belongs to, those in power. They may make a case of corruption, betrayal to Vz, or something like that which they should have plenty of documentation for and asked him to resign. For some reason I believe it will the Military who will end up in power there. The military are in power already, just not the Venezuelans but the Cubans. The path of least resistance is the favoured process in Venezuela where the answer is often sought from outside Venezuela or indeed from someone else at least. That can take two different paths, very much as indicated in the post. Will the "military elite" side with Maduro or Cabello ? If the latter is the key to the future could there be a split within the armed forces ? Or is this just a war on democracy camouflaged by some other means ? I'm not sure but the Cubans should not be underestimated. What is good for Venezuela has long been forgotten. But what is clear is that there is a crisis in Venezuela and that is a worry for the Castros. So Maduro heads off to China and Cabello to Russia. There was a time when Fidel threatened to bump off Raul after an unauthorised deal with the Chinese. But times have changed and desperation has overtaken ideology. Venezuela is no longer the cash cow Cuba created and when Cuba is desperate the game becomes a little clearer, I think. So Maduro/Castro dumps Merentes, Cabello is pensioned (or similar), the "military elite" slides towards Maduro, the Cubans sharpen their knives, the Generals sit on their fat arses as has been their modus operandi when challenged, democracy is finally squeezed and the rest of us head off to the playa. That unfortunately is the path of least resistance. Maduro can do whatever he wants to the opposition without an enabling law. I think he wants to use it to consolidate his power within Chavismo. did anyone read about the "cutting funds to private entities in venezuela"? i just read it at el universal, what does that mean? last I heard most private companies are buying through black market anyways, whether it goes through PDVSA through back doors or whatever... does that mean that Cadivi/Sitme values wont be sold to private sector? and who do they consider the private sector anyways? Polar? I am just wondering what people think about this? I'd assume that just pushes the black market rate even higher right? Maduro can steal more with enabling laws. By law, Venezuela will simply place all funds into the Maduro Foundation bank account. From there it will be distributed to needy friends of Maduro. I will hope will start to think about the total near complete control of the press..I am waiting for them to shut down El Nacional and El universal..... just for them reporting what "Capriles" says... maybe even they will arrest Capriles? horrifying how controlled the "free voice" of the people is now under the Government shadow..
My prediction, gradually any opposition newspapers will no longer receive newsprint and on top of that will regularly receive fines, individual reporters will be arrested at a slow pace. Arresting a few will do the job. Capriles won't be arrested because it would do too much damage to the government internationally, and he can't do much without any outlet to reach the population. The rest of South America could not care less what Venezuela does to its media and reporters, as long as it is gradual and Venezuela offers them plausible deniability. If it becomes a do or die situation (oil drops a lot) they will arrest him of course, but they would like to avoid that. At this point, I don't think there is a political solution to Venezuela. It pains me to say this, but I now have to admit Alek Boyd was right all along. Until a super-majority of the Venezuelan people get a clue and take to the streets, Chavismo will remain in power and continue shutting off any legal outlet for disagreement. When will that happen? Who knows, it's mainly a function of the greed and corruption of the Boligarchs and the price of oil. It will be interesting to watch though.